I often hear people say that there are no original ideas left in this world. Being a creator of ideas and an optimist, I usually scoff at such notions. That being said, I can’t tell you how many times I’ve come up with something that I thought was original, only to be disappointed by a Google search that reveals the other 10 people who have already thought of it. Well, I’m glad to be able to report that there are in fact undiscovered ideas. 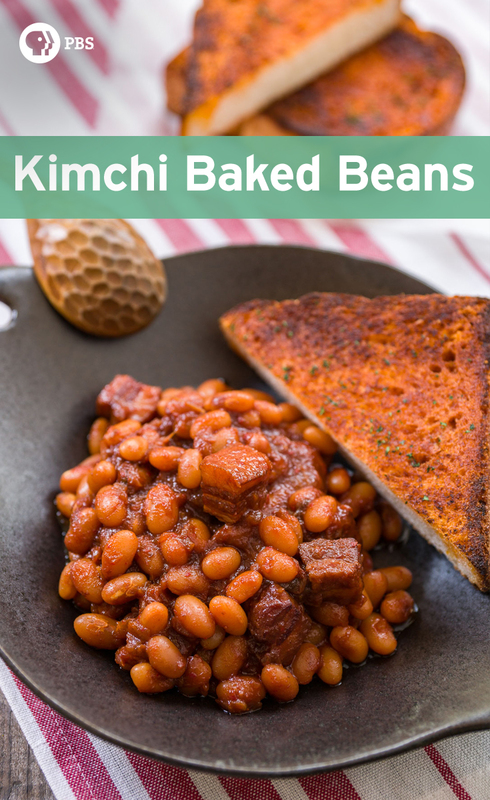 As of April 25, 2016, no one on the Internet has thought of using kimchi to make baked beans. 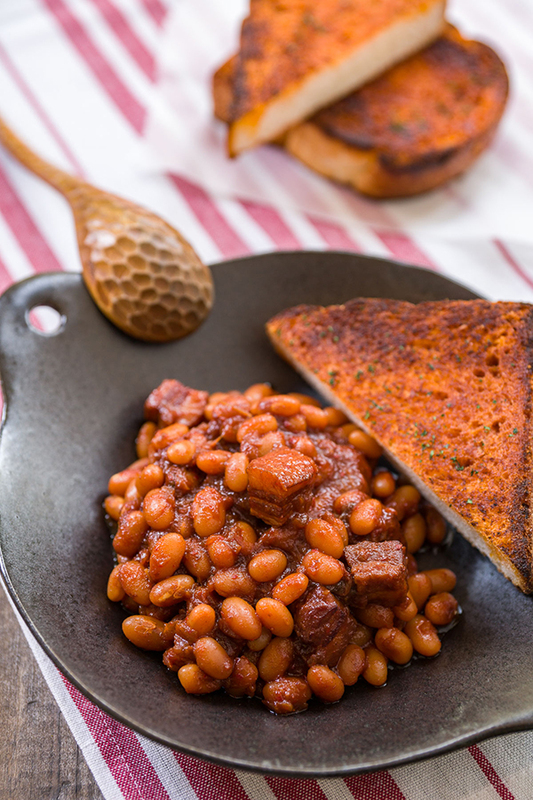 Now novelty in and of itself doesn’t mean too much as any 3 year old can mix 3 ingredients together that no grown-up would ever think about doing, but kimchi, bacon and beans are a combo that’s not only new, it’s absolutely delicious! Honestly I don’t remember the thought process behind how I got here, but I was munching on kimchi one day and this idea of using kimchi to season baked beans popped into my head as a complete thought. To make it happen, I more-or-less followed my usual baked beans recipe, but replaced all of the flavoring ingredients (like onions, cloves and mustard) with kimchi and its juices. A small dollop of gochujang goes in for a little extra heat and depth, and finally instead of hitting the beans with apple cider vinegar at the end, I add a little rice wine vinegar instead. 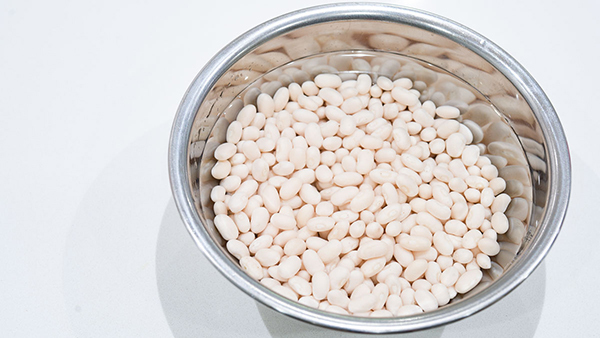 The finished beans come out a stunning shade of carmine, with the familiar sweet and tart taste profile, but with a broader palette that’s savory, fruity and loaded with umami. There’s also a pleasant heat that deftly balances the sweetness making this something you could actually eat a plate of as a main, rather than as a mere side to accompany other food. In case you’re wondering why I squeeze the kimchi juice out of the kimchi only to reintroduce it later, the reason is that the kimchi will not brown if there is too much liquid in it. By squeezing out the juices, you can get it to brown quickly, allowing you to take advantage of the Maillard Reaction to up the flavor ante. Another important thing to note is that I used just enough liquid in this so that the finished beans would have just the right amount of sauce without burning in my pressure cooker and on my stove. On more powerful stoves, or pressure cookers that vent more steam, it’s possible you’ll run out of liquid and burn the beans. If you’ve had problems with food burning in your pressure cooker before, you may want to add a little extra water to be safe. If the beans are too watery when you open the lid, you can always boil some liquid off afterwards. Put the navy beans in a large bowl and cover with several inches of cold water. Let the beans soak overnight (12 hours). 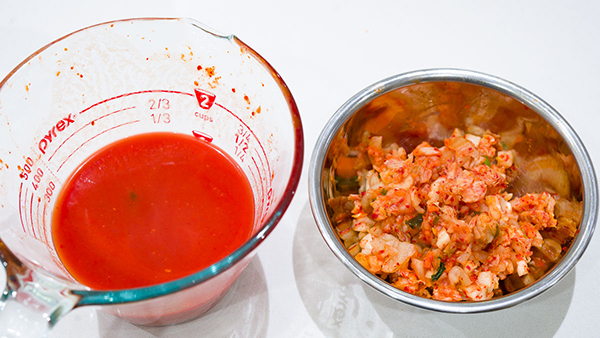 For the kimchi, you need to squeeze as much liquid out of it as you can before measuring it. Save the kimchi juice for later. 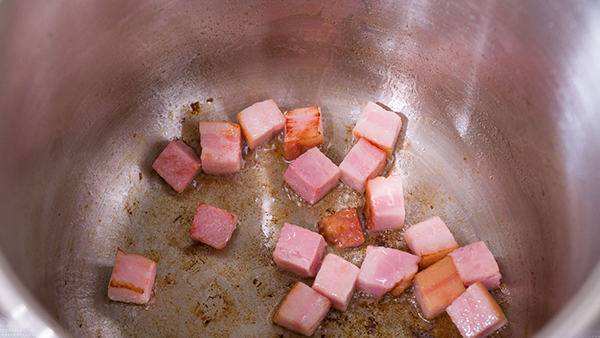 Add the bacon to the pressure cooker and place the cooker over medium heat. Fry the bacon until some fat renders out and the bacon just starts to brown (don't fry it until crisp). 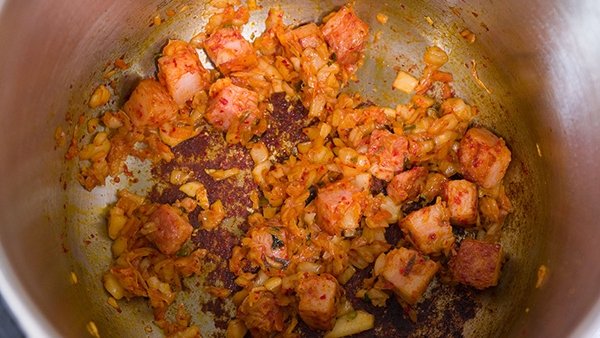 Add the kimchi to the pot and fry until the kimchi starts to brown and is very fragrant. Add the water, tomato juice, kimchi juice, brown sugar and gochujang to the cooker. Drain the soaked beans and add them to the pot as well. 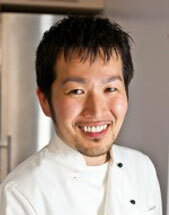 Afix the lid, set to high pressure and bring the cooker up to pressure over high heat. Adjust the heat down to the point between having a steady hand and no sound and set the timer for 25 minutes. When the timer finishes, turn off the heat and let the pressure come down naturally. When the pressure has fully dropped, open the lid. Any liquid remaining should be nice and thick, if it's soupy, turn the heat back on and boil uncovered until the beans are the proper consistency. Stir-in the vinegar to finish the kimchi baked beans and serve.